Extension springs must have a means for attaching them to components in your device or assembly. Ends can be loops, hooks, threaded inserts or swivels. The end configurations on extension springs are unlimited but always perform the same basic function. Position of the ends can be random or can be designed with specific orientation to each other and to the extension spring body. (See our Extension Spring Worksheet in the downloads section.) Stresses present in the loops can be higher than those in the extension spring body. Calculation of these stresses is complex but it is a vital component or your final extension spring design as they can strongly affect performance, especially in cyclic applications. Extension springs are most commonly formed with a closed coil configuration, where each coil is in contact with the adjacent coil. The "initial tension" in the extension spring body determines how tightly these coils will be held together. Manipulating the initial tension during spring design will help achieve the desired load requirements for a given application. Stress considerations are important with any spring design. The maximum recommended stress for extension springs with low initial tension requirements is easily calculated. Extension springs with high initial tension requirements cannot be adequately stress relieved and will require reductions in the maximum recommended stress. Sometimes special end hooks, swivel hooks, or plugs are used to improve the spring function. We can assist the client in design of these features, as required by the application. An effective extension spring design will always satisfy the four basic operating requirements; Energy, Space, Environment and Service. 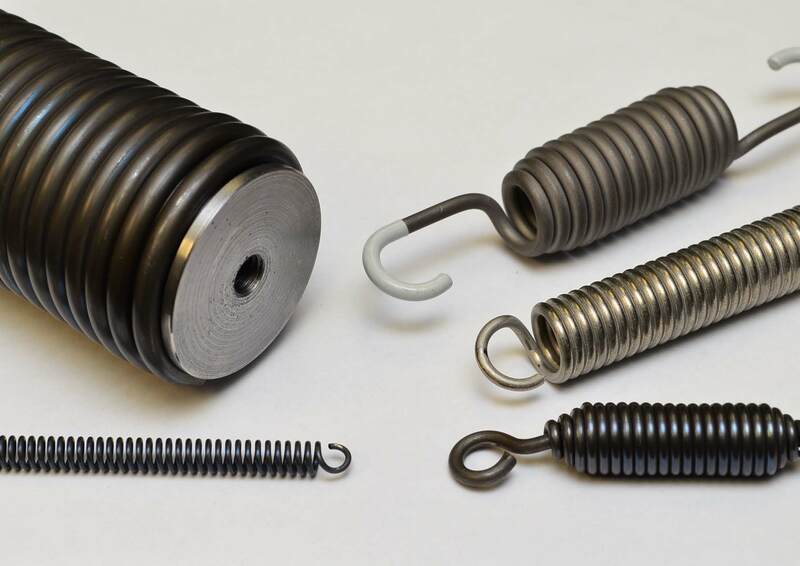 With appropriate consideration and a quality spring design program you’ll have the best extension spring possible for your application.